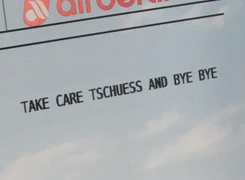 The 8,000 Air Berliners felt this farewell note, which stood on the carrier’s passenger tickets last Friday, like a stab in the heart. 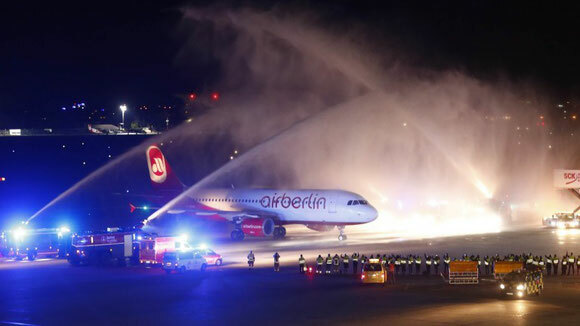 Air Berlin, founded 1978 by U.S. pilot Kim Lundgren, is now history after their last Airbus landed at Tegel at 23:46h local time Friday night. 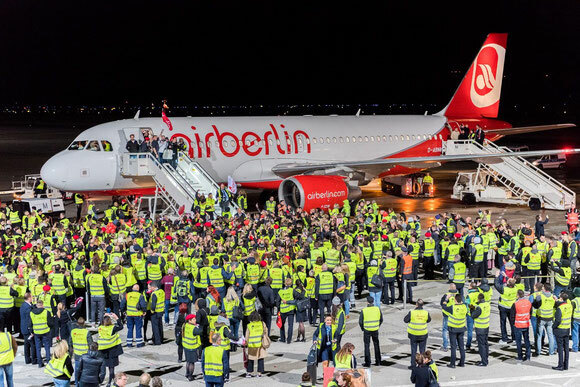 Heartbreaking scenes: Hundreds of Air Berliners welcomed the last AB Airbus on the apron of Tegel Airport after its arrival from Munich, applauded Captain David McCaleb, First Officer Roland Koch and the entire crew and embraced each other. Moving scenes wherever one looked. Despite these touching moments full of melancholy, fact is that Germany’s number two airline next to Lufthansa belongs to the past after thirty-nine eventful years in the air. There are many reasons for the failure of the carrier: an undefined business model fluctuating between low cost carrier, leisure or intercontinental airline, many personnel changes on the top deck together with partial mismanagement, and an ambitious expansion program that proved to be too costly and inefficient. In addition, the delay of Berlin’s BER Airport, where AB intended to set up their central hub, tore deep holes in the pockets of the airline. Now, the remains of AB will be split into parts with former rival Lufthansa and their low cost subsidiary Eurowings taking over the largest chunk during different stages and steps, namely 81 aircraft together with hundreds of staff, paying 210 million euros. The money replaces part of the €250 million loan granted by the German Government to keep the insolvent carrier in the air until 28 October, facilitating negotiations with potential buyers. Air Traffic control paid homage to the airline by changing the flight number on short notice from AB6210 to BER4EVR just moments before landing at Berlin Tegel. However, the entire LH offer is pending the approval of the EU competition watchdogs. Market observers expect that they will give the deal green light after Easyjet and the bankruptcy administrator signed a 40 million euros agreement Friday night, implying that the low cost carrier leases 25 former Air Berlin aircraft, obtains access to the carrier’s slots at Tegel Airport, and hires up to 1,000 AB staff. Easyjet has indicated that the former AB aircraft will be mostly operated on domestic German routes, thus preventing LH to build monopolies on certain intra-German rotations. Thanks to Easyjet’s step it can be assumed that the EU competition commission will rubber-stamp the AB-LH deal in whole or in most parts. Air Berlin’s cargo business, outsourced to Leisure Cargo years ago, is not affected since the freight daughter was sold to forwarding agent Zeitfracht last week. It is noteworthy to say that Leisure Cargo has been always a separate and independent legal entity, thus never belonging to the bankruptcy estate of its parent Air Berlin (see separate report in this issue on Leisure Cargo).